Just when you thought the XR-Series couldn’t provide any more value in a heavy-duty compact 4WD tractor, the XR4046C delivers even more. With 15% more raw engine horsepower to climb steeper grades and pull heavier loads and 14% more PTO horsepower to take on harder soil conditions, cut taller grass, and clean up denser brush than the XR4040C, this workhorse can make quick work of even tough jobs. 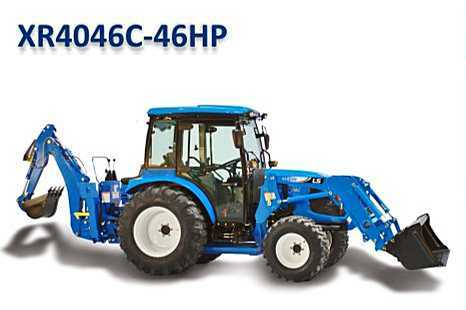 The XR4046C is powered by an innovative, eco-friendly, TIER 4 engine that delivers outstanding performance that’s quiet and smooth whether idling or delivering maximum power. In addition to power, this powerhouse climate controlled cab compact tractor also provides you with versatility, efficiency and comfort. The fully synchronized 16 forward and 16 reverse gears let you select the perfect operating speed and change gears without stopping. Easily change direction with the convenient shuttle shift. Select between independent or manual PTO with the turn of a switch and easily attach hydraulically operated implements like rakes, backhoes, wood splitters, and other hydraulically controlled implements with the two sets of rear remote valves that come standard. The loader is quick attach, skid steer compatible and comes standard with the grill guard. It doesn’t stop there; the extendable lower links make changing 3-point implements very easy. And you get more operating speeds, more front end loader lift capacity and more standard features than the competition. About the only thing you get more of with the competition is their price.